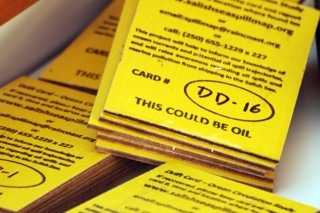 Walking down their favourite beach, Sian and Allan were not thinking of oil spills until they found a bright yellow drift card and its message, This could be oil.What makes Sian and Allen’s find so interesting is the fact they live on Haida Gwaii – over 1,000 km from where the card was dropped. Suddenly they too were “directly affected” by an oil spill in the Salish Sea.”Directly affected” is a new term used by the National Energy Board to screen public participation in their review of Kinder Morgan’s proposed Trans Mountain tar sands pipeline expansion. 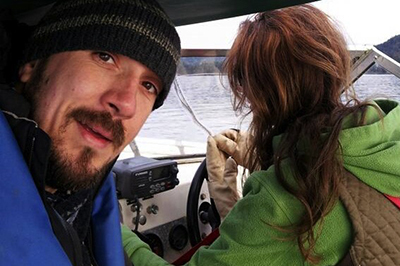 To help communities that live in and around the Salish Sea apply, Raincoast’s Misty MacDuffee and Ross Dixon spent 10 days in ferries, boats and Gulf Island community halls engaging residents. They were welcomed by “raging grannies” and inspired by people’s passion for the coast. By Wednesday’s deadline, over 2,100 individuals and organizations had applied! The drift card drop is one component of Raincoast’s efforts to highlight what’s at risk from dramatic increase in oil tanker traffic that will accompany Kinder Morgan’s proposal. Most recently, we have dropped cards at Kinder Morgan’s modeled accident location near Turn Pt. 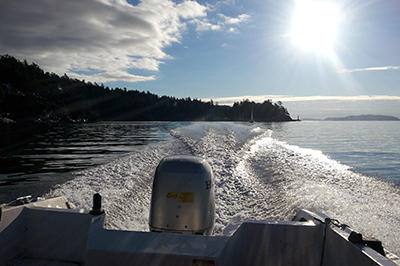 in Haro Strait to see how their projections compare with our findings. We’re asking you to support the next stage of our drift card study. We need to secure $5,000 by April. Our costs include the cards themselves, vessel time and staff time to verify hundreds of card recoveries and then convert this information into scientific evidence. Our findings will be presented at the Salish Sea Ecosystem Conference in May and then utilized in our work to stop the Trans Mountain expansion. Look out for drift cards! S. Vancouver Island, the Gulf Islands, the San Juans or on the Olympic Peninsula, keep your eyes open for drift cards washing ashore on your local beaches. 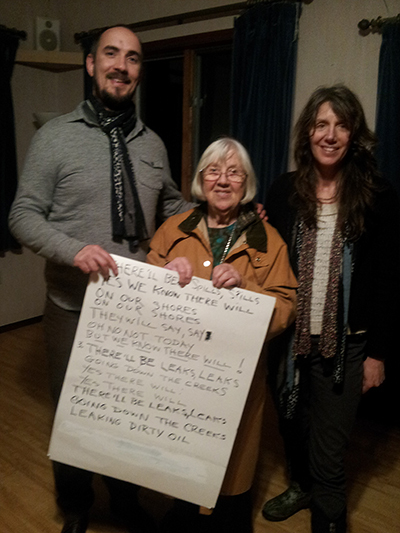 Raincoast’s Ross and Misty with a concerned citizen during an information session on Gabriola Island. 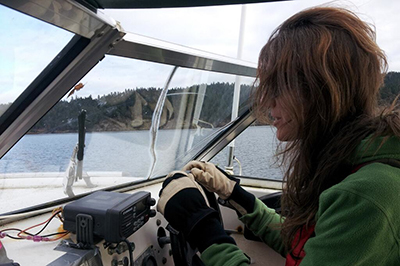 With support from the Gulf Islands Alliance and the Georgia Strait Alliance, Raincoast’s Ross Dixon and Misty MacDuffee visited Gulf Islands directly affected by Kinder Morgan’s oil tanker proposal. Their goal was to quickly inform Island residents about the National Energy Board’s window for the hearing process and assist them with their applications. Photo credits: Ross Dixon, Andy Wright.